The letters can be decorated any way you want or painted and they are only $4 each. You can use these to spell a word or phrase ("bath" or "eat" are some examples) or use as a monogram. The globe lantern could be hung in an office. My favorite item above is the sunburst mirror. The suitcases would look cute on a console table or, again, in an office. Great for small storage. You could stick with just one color if the two are too much. The pendant flag could add flair to an outdoor party. 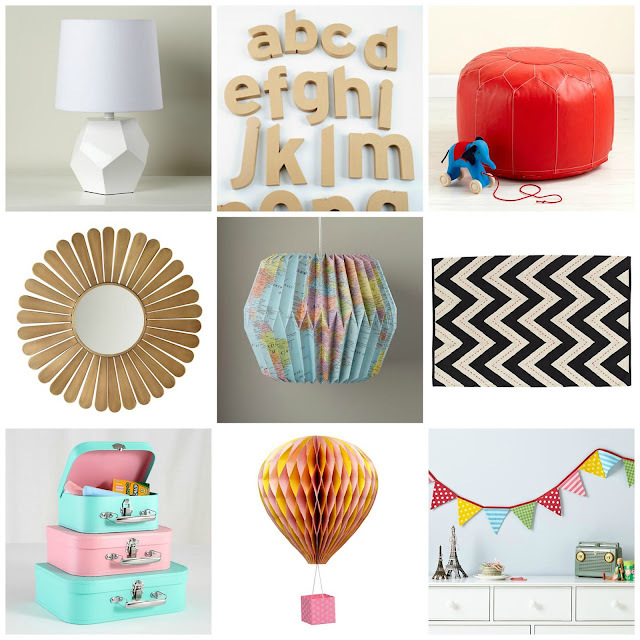 I added the hot air balloon because I love this and may get it for Summer's nursery! Update: unfortunately the globe lantern is no longer on the website. I'm guessing it must have sold out (I saw it just last week).